Component transport | Roll on to the new ramp! Roll on to the new ramp! A new roll-on/roll-off ramp will facilitate the transhipment of components in Fos harbour. Since early 2015, the seven ITER Members have been shipping components to ITER. The largest of these—called highly exceptional loads—can weigh up to 600 tonnes and require sophisticated logistics and robust infrastructures to transport and manoeuvre. When they reach the industrial harbour at Fos-sur-Mer (Marseille, southern France) the journey is far from over. A sequence of delicate operations still needs to be performed before the components can be transported over three to five nights to the ITER site, which is situated some 100 kilometres to the northeast. This phase, which is essentially a transfer from sea-going vessel to land transporter, is by far the most challenging, as the more handling a component is subjected to the longer the time spent and the higher the cost and risk. In order to simplify, secure and focus the transhipment sequences, new equipment has recently been added to the existing harbour infrastructure in Fos-sur-Mer. 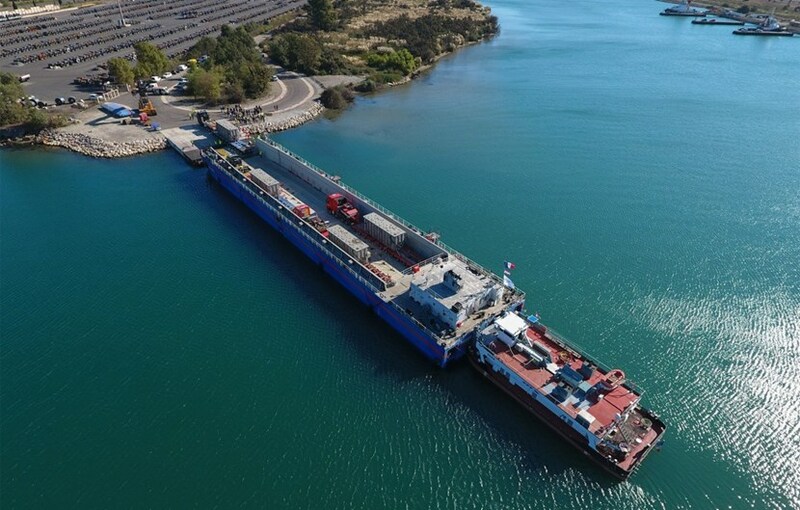 The new RO-RO ramp is a EUR 2.7 million investment jointly financed by Agence Iter-France, the agency that acts as interface between ITER and its host country (85 percent of the total cost); the cargo handling company Sosersid; the barge operator CFT; and ITER global logistics provider DAHER. "This equipment is an important milestone in France's commitment to the ITER Project," said Jacques Veyron, the director of Agence Iter France. The roll-on/roll-off ("RO-RO") ramp that was inaugurated on 20 September eliminates the need for vertical handling once the component has been unloaded from the ship. Although the ramp will be accessible for other uses, priority is given to the ITER loads when they come in. Approximately 18 metres long and 30 metres large, the new RO-RO ramp is the largest of its kind in France. Representing an investment of EUR 2.7 million, it can accommodate combined loads (components and trailers) of up to 880 tonnes. Four rectifier-transformers shipped by ITER China, each weighing close to 130 tonnes, were the first to use the ramp on their way to ITER last week (read related article). In the six years to come, the ramp will accommodate approximately 200 highly exceptional loads (HELs)—among them the first toroidal field coil and the first vacuum vessel sector, both expected at the end of 2018.